Expedience Software is pleased to make the following automation tools available to proposal and sales team members to improve speed and efficiency in the challenging work of RFP and proposal production. Submit your request through the hyperlinks below and the tools and associated User Guides will be emailed directly to your inbox. 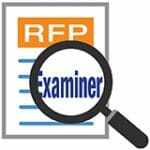 The RFP Examiner is a Microsoft Word Add-in (‘.dotm ﬁle’) for Windows developed by Expedience Software. This tool extends the built-in functionality of Microsoft Word by automating the process of analyzing RFPs and generating matrix reports based on highlighted text and inline comments. The Expedience RFP Inspector is a Microsoft Excel Add-in (‘.xlam file) that allows you to inspect an Excel RFP or other spreadsheet, for locked cells, data restrictions, and other criteria, even if the Spreadsheet is protected.